Charles Tuttle: I don't pose, I don't preen, I don't put perjured testimony on the stand. I don't make a mockery of the American legal system. Richard Rietti: Well, you have your style, and I got mine. I think it was about five years ago when I first discovered that this 1997 lawyer comedy existed. It took me this long to finally get around to seeing it, even though I've been familiar with the two stars for quite some time now. 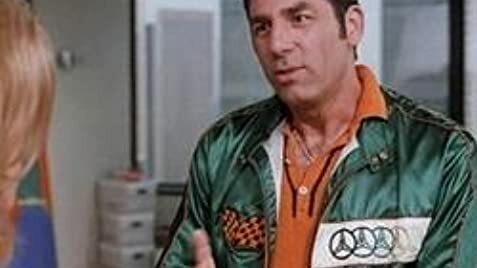 I've seen Jeff Daniels as Jim Carrey's co-star in "Dumb & Dumber", and knew the now infamous Michael Richards obviously for his role as Kramer in the popular sitcom, "Seinfeld", plus his roles in comedy films such as "UHF" and "So I Married an Axe Murderer". 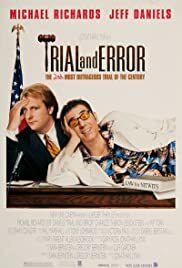 Since I had seen both of these actors in funny movies/TV shows, I figured I might find "Trial and Error" mildly amusing, nothing more, judging by its general reception. Expecting a mixed blessing, I didn't get any big surprises, pleasant or unpleasant. Charles Tuttle (Daniels) is a lawyer who will soon be married. His best friend, and best man for the wedding, is an out-of-work actor named Richard Rietti (Richards). Tuttle has been called over to Paradise Bluff, Nevada to defend his fiancée's relative, Benny Gibbs, in a class action fraud suit. When he arrives in the town, Richard (or "Ricky") is there, and is ready to throw a bachelor party for his friend. After drinking and getting attacked in the bar, Charlie is not well enough to work the next day, so Ricky decides to go to the courtroom and claim to be a lawyer named Charles Tuttle! Charlie is not happy when he hears what Ricky has done, and soon finds that he now has to pose as an actor named Richard Rietti! Since the real Rietti is not trained to be a lawyer, the real Charlie pretends to be his assistant, using cue cards to tell him what to do on the job while he defends Benny. Obviously, this leads to a horrible mess! There weren't too many times when I laughed really hard while watching this 1997 comedy, but there were many parts I found at least mildly amusing. I can't forget Ricky discovering that his sick friend in bed has emptied out his pill bottle, Ricky trying to prepare Charlie for the trial while he is ill, Charlie's reaction when he learns what Ricky has done, and many things the main characters go through while they pose as each other. Michael Richards and Jeff Daniels are a good pair in the lead roles, which might be the main reason why this film is funny. Richards, with his over-the-top antics, playing a character with good intentions who keeps lousing up, and Daniels, with some of the faces he makes and his character's reactions to Ricky's doings. Unfortunately, the plot isn't too interesting, and if the film were hilarious, that wouldn't matter, but it's not funny enough to prevent the movie from being a little dull. Also, the romance wasn't done so well, eventually getting a little sappy, and the ending leaves much to be desired. This movie came out the same year as "Liar Liar", another lawyer comedy. That film is definitely the more popular of the two, but I have to be honest, I prefer this one, as crazy as many people might think I am for that. While Jim Carrey has made me laugh in other films, I found that his antics went too far in that one. Richards and Daniels, while not usually hilarious in the film, are still pretty funny. I'm sure we all know about Richards' racist tirade in November 2006, which obviously permanently damaged his reputation and started a never ending debate over whether he really meant what he said and whether his apology was honest or not. It clearly had more impact than Mel Gibson's tirade earlier that year, and the main reason for that was probably because Richards was caught on video. I remember feeling like I could never watch anything with Richards in it again after I first heard about the incident and saw the footage, but now, regardless of his reputation and what may go on in his head, I have to admit, he can still make me laugh in the comedies I see him in. If you like the two co-stars in "Trial and Error" as comedians, then this flick could easily make you laugh, or at least some parts could.